Synopsis: Scooby and the gang confront an anonymous masked villain who is plotting to take over the city of Coolsville by wreaking mayhem with a monster machine that creates Mystery Inc.’s classic foes like The Pterodactyl Ghost, The Black Knight Ghost and The 10,000 Volt Ghost. Meanwhile, the gang’s detecting abilities are scrutinized by relentless reporter Heather Jasper-Howe (Alicia Silverstone), aided by museum curator Patrick Wisely (Seth Green) and thwarted by nasty Jeremiah Wickles (Peter Boyle). 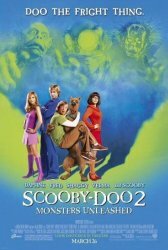 'Scooby Doo 2' Set Pics From Vancouver! 'Raymonds' Peter Boyle Cast For 'Scooby-Doo 2'?